Good quality fuel is a must and will help you to gain the highest levels of efficiency from your wood burning stove or multi-fuel stove. Consult a respected source such as HETAS or the Solid Fuel Association to find out where your nearest approved supplier is and invest in properly seasoned logs with a moisture content below 20% or high quality solid fuel. Using properly seasoned logs in your stove can give you up to twice the level of heat output compared to burning green logs, although it is worth noting that green wood logs can be cheaper to buy. 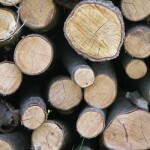 Try this useful blog for advice on ‘How to dry your own logs’ as it has essential tips on preparing and storing green logs to burn which can be very cost effective. A clogged appliance will require a greater amount of fuel to burn so ensure you book a HETAS registered engineer to service your wood burning stove or multi-fuel stove. It is recommended that you do this once a year so put it in your calendar for late summer to ensure your stove is ready to burn when the weather begins to cool. This will save you time, space and money as your stove will require less fuel to generate the warmth you need during the long winter months. If you are burning wood, ensure your chimney is swept at least twice a year; this can be reduced to once if you are using multi-fuel in your stove. Book your chimney sweep to attend just before you want to begin using your stove on a regular basis again; this is particularly important if you haven’t used your stove for a while. HETAS advises that those with a wood burning stove should book their chimney sweep to attend a second time, just after the peak of the heating season. 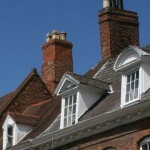 If you need to find an approved chimney sweep consult the listings from HETAS. Make sure that you have given your stove time to cool down completely before you begin. It is important for your safety that your appliance is cold to the touch. You need to remove several internal parts of your stove; this can include the baffle, firebricks, grate and ashpan. Always consult your stove’s instruction manual for guidance. If you need any further help try consulting a site with useful ‘how to’ videos such as www.stovax.tv. Remove ash and debris with a vacuum. To protect your regular vacuum, invest in an ash-clean from Stovax which is an attachment for your existing appliance provided that it is fitted with a dust bag. Wipe down the inside of the stove or fire with a brush or scraper. Vacuum the inside of the stove again to collect any debris you have loosened. Use a wire brush to clean the grate and any related parts. This is a good time to check the grate to ensure it is in a good condition. Now turn your attention to the firebricks and clean these with a soft brush. Again, take this opportunity to check your stove’s firebricks for any splits or cracks. 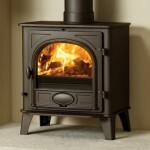 Your local retailer will be able to obtain spare parts for you should you believe any bit of your stove needs replacing. You can now return each of the internal parts of your stove. Check the rope seal in the door of your stove; if it is old or worn, you should replace it. A useful step-by-step guide to assist you can be found on www.stovax.tv. If the door catch and hinge pins are stiff, lubricate them with a little oil. Finish with an image refresh! Use an aerosol paint or colloidal black cleaner (as appropriate) to smarten the exterior of your stove. Again, your local retailer will be able to advise you on what you need for your stove. Please note that a stove with an enamel surface should be cleaned with a soft cloth that you have dampened. Your local retailer will be able to advise you on all aspects of cleaning and obtaining spare parts for your stove. 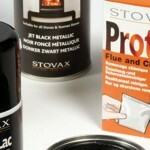 Stovax has a range of stove cleaning products and tools to help you easily and safely remove ash, soot and other debris from the firebox. www.stovax.tv has a range of easy to follow videos with essential advice and tips. HETAS is the official body recognised by Government to approve solid fuel appliances, fuels and services has a wealth of information on caring for your stove as well as invaluable listings of respected and fully trained engineers and chimney sweeps. The Solid Fuel Association has information on wood and multi-fuel suppliers. Wood burning is a nice way to warm your home. Good morning Aileen, Thank you for your message! We would recommend that you seek further advice from your local retailer. Please see link>>> https://www.stovax.com/information/find-a-retailer/ Many thanks! What’s the best method for cleaning the glass on a multi fuel stove?